A ten strong team of employees from a leading Yorkshire business have completed a gruelling 129km cycle challenge – raising over £4K for Leeds cancer charity Maggie’s Centre. Kyle Spencer, Jamie Gibson, Matthew White, Alan Gibson, Lee Nicholson, Abbie Clarke, Kevin Dawson Jane Dawson, Paul and Kay Hebden from Heckmondwike-based noise control specialists Wakefield Acoustics, cycled a challenging route which included a punishing 6700ft of climbing across Yorkshire, on Sunday 6th May, as part of the Maserati Tour de Yorkshire Cycling Sportive. The Maserati Tour de Yorkshire ride took place throughout Yorkshire, with professional riders taking on the demanding course between 3-6 May 2018. The sportive took place on the final day, allowing amateur cyclists to ride many of the same roads as the professionals before they do, including the pro finish line in Leeds. The Wakefield Acoustics team began at 6.30am and cycled the 129km course, taking in some of the county’s most iconic roads, including a ride up the famous Cote de Greenhow Hill and Cote de Otley Shevin, before heading back to Leeds to finish their journey. In September last year, three directors from the same company raised thousands of pounds for MIND and Women v Cancer charities by cycling the Deloitte Ride Across Britain 969 cycle challenge. The 969-mile ride passed through 23 counties and had a total climb over the duration of over 48,000 feet, equivalent to 1.5 times the height of Mount Everest. 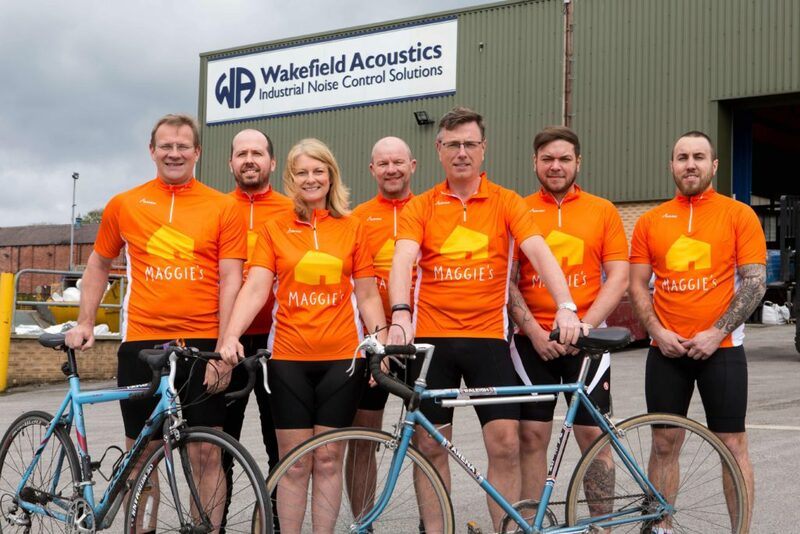 Jane Dawson, group managing director at Wakefield Acoustics, commented, “Last year’s charity cycle ride was a memorable experience and it was fantastic that we did it to raise money for two very worthwhile charities in MIND and Women v Cancer. This year, we wanted build on that success and came back with an even larger team to take part in the Maserati Tour de Yorkshire Cycling Sportive to raise funds for a fantastic local cancer support charity – Maggie’s Yorkshire.